Chicago Cubs third baseman Aramis Ramirez fields a ground ball hit by Cincinnati Reds' Homer Bailey in the third inning of a baseball game on Thursday, Sept. 15, 2011, in Cincinnati. 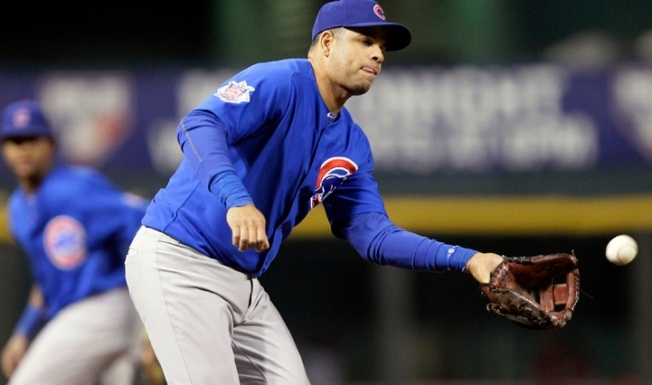 Aramis Ramirez may have played his last game at Wrigley Field in a Cubs uniform. The third-baseman is out of the lineup with a mild quad strain for the Cubs' Wrigley finale against Milwaukee, one day after he told reporters he believes he's gone. "Probably. There's a good chance. I'm a free agent and I don't know what's going to happen. But it looks like I'm going to hit the market." The Cubs have until five days after the World Series to decide whether to exercise Ramirez's $16 million option. Yet Ramirez said neither he nor his agent, Paul Kinzer, has spoken to Chairman Tom Ricketts. "I think we're ready to move on," Ramirez said. Ramirez is hitting .306 with 25 home runs and 92 RBIs this season.